An Uncle of mine used to work for MWSS (Metropolitan Waterworks and Sewerage System) or more popularly known as "NAWASA". I'm no stranger to the wonders of the Balara Filtration either because it's where I used to study lifesaving and swimming lessons under the Philippine National Red Cross as kid. 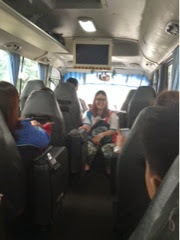 But when the opportunity came to tour and revisit both places again for the Manila Water Lakbayan Tour invite for Mommy Bloggers Philippines. I immediately signed up knowing it's going to be an educational one, plus I also had the chance to tag my beloved Kyle, for him to see where does tap water come from? 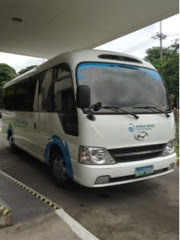 First up, we were given an early lunch at Cafe Via Mare, GT Toyota Branch in UP Diliman. 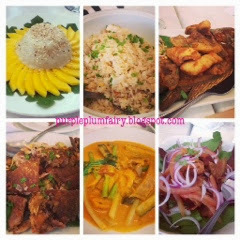 We've had an array of viands from Kare-kare, Crispy Pata (which Kyle ate with gusto), Green Salad topped with Crispy Bacon Strips, Salted egg and tomato fried rice, Fried Tilapia with mango salsa and Coconut Sticky Rice with ripe mango slices and sesame seeds. While munching, I got to chat with other Mommy Bloggers as well as the amiable Ms. Angel Tudtud of FullCircle Communications and Ms. Kassy Pineda, New Media Manager of Manila Water. We were given a short briefing for our Lakbayan tour itinerary. After the feast, we were surprised to see the Manila Water Coaster right outside Cafe Via Mare. The 21-seater coaster was huge and indeed new with a flat-screened television mounted inside. Our first stop: The Manila Water Lakbayan Center! 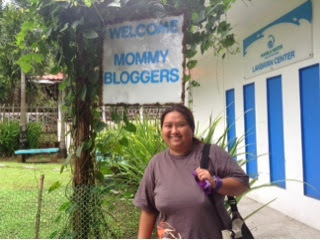 Oh, we were touched to have seen a "Welcome Mommy Bloggers" signage upon the entrance. At Lakbayan Center, we were given a short lecture/presentation on Manila Water's history, its efforts in improving its service, its vision, and developments throughout the years. 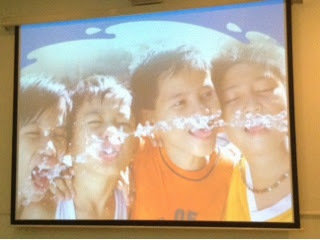 There were a lot of things that were clarified with the half an hour lecture/discussion about Manila Water. There's a common misconception among Filipinos that the former MWSS resorted into privatization. First, it's not totally made into private but rather there was a partnership that transpired between Private-Government in which Ayala led Manila Water to take responsibility over Metro Manila's East Zone. 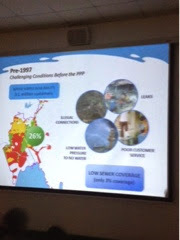 Thus, Maynilad (Manila's West Zone) and Manila Water (Manila's East Zone) came about. These two companies are both under private sectors in partnership with the government, which explains why they have different Tariff amount. The main goal of this Private-Public partnership was to further boost operating efficiency, amplify service coverage and enhance service delivery. Back in the year 1997, there were roughly 3% of the metropolis were connected to sewers, the rest of used water either go to poorly maintained or improperly designed septic tanks then which directly proceeds to the city's natural bodies of water. Manila's waterways have been clogged and considered as biologically dead because of pollution. Manila Water helped in the rehabilitation of the three major river systems in the city, namely: Marikina, San Juan and Pasig Rivers. Manila Water has put up 38 used water treatment plants to treat used water from households to bring back used water to rivers. It was indeed a very informative presentation. I had no idea that Manila Water cleans our septic tanks/sewer lines every 3-5 years to desludge wastewater before it is treated to become Class C Effluent Treated Wastewater which isn't potable for humans but can support marine life. Manila Water's goal is to treat one billion liters of wastewater daily to decrease roughly 75% pollution of the covered area. 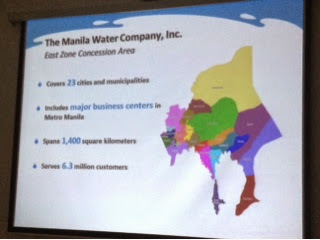 Manila Water now covers 23 key cities and municipalities over Metro Manila's East including commercial and business establishments and spans 1,400 square kilometers and serves 6.3 million (99%) households 24/7 as compared to the 1997 data of serving only 3.1 (23%) consumers. Since water is precious, Manila Water ensures the safety and round-the-clock water supply of its customers. We have also learned that Metro Manila's main water source comes from Angat Dam, water then travels to Ipo Dam and proceeds to La Mess Dam. Then it is conveyed to either the Balara Treatment plant or to the East La Mesa Treatment plant to undergo further cleaning using several treatment processes to make sure that water is safe to drink before making its way on our faucets. They regularly tests 847 water sampling points physically, chemically and microbiologically and assures that they comply with the parameters given by the Philippine National Standards for Drinking Water and the Department of Health. 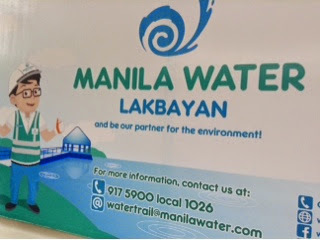 Through Manila Water's flagship program for marginalized communities in the urban poor communities, people who used to have illegal water connections were able to convert to regular water service connections so they now have access to potable water from the tap. 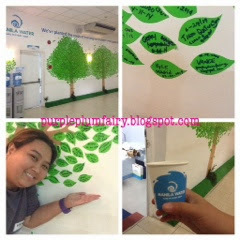 After the said presentation, since we have learned much about Manila Water's background and its purpose, we were all given a leaf to stick to their Seeds of Learning Wall. I wrote my name and my blog's url on my leaf before putting it on the wall. Then, we proceed to the Metrology Center where all residential and commercial meters are tested for accuracy and quality. We were taught how to properly read the water meter. 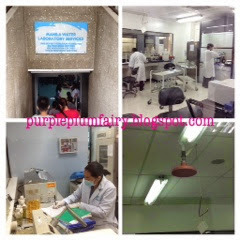 From there, we went to the Manila Water Laboratory Services. I hadn't seen an actual laboratory (of course, aside from our Science related class in school) until we came here. Water samples are tested here. There's a phychem water laboratory, an isolation room, and bacteriological wastewater laboratory. There's even a ready shower with pull in triangle in the middle of each room just in case there's an accident or a chemical spill somewhere. Kyle, was just as curious because just like me he hadn't been exposed to Science as close as this. 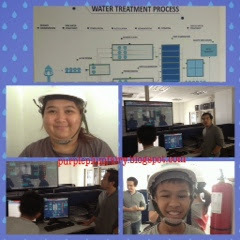 We then proceeded to the actual treatment plant where we were required to wear a hard hat. 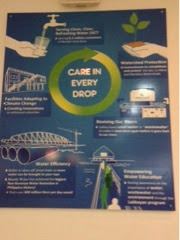 There we saw how wastewater were properly treated. Sorry but we weren't allowed to take photos on most areas. Soon it was time to go home. 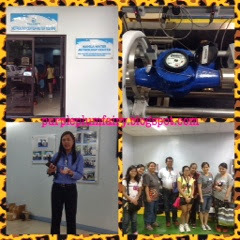 Thanks to Manila Water's Lakbayan Tour because it was not only very informative and educational, but eye-opening as well. 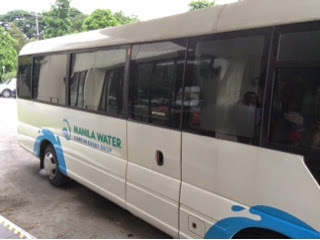 As one of Manila Water's customers, if it hadn't been for this bloggers' tour, Kyle and I would have no idea where does our water come from and what do they do with used wastewater. Now, Kyle has completely understood the importance of water and why it should be saved and used properly. 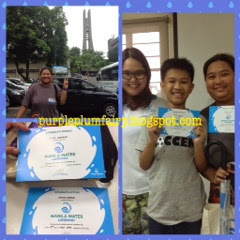 Just as all Mothers who care for their kids, Manila Water cares for customers with TLC. Every drop of water from our faucets, Manila Water makes sure it went through the long process of filtering, screening, treating etc. and has that guarantee that there's potable and adequate water supply. In this modern age, we had social media to thank for bringing brands closer to its consumers. Manila Water may now be reach via its Facebook account www.facebook.com/manilawater for water tips, trivias and other useful information, or follow @ManilaWaterPH on Twitter for live updates on service advisories. Customers may also report leaks or other concerns through these social media platforms as well as by calling Manila Water's hotline: 1627. It's nice to know how the two water companies came about. Also, water in the Philippines is precious and considerably, the bill is way cheaper than European countries so I have to be thankful. Its good to know that they are doing what they've promised to the people. I also appreciate manila water because of their presence in races. It's also nice that they have the lakbayan tour to educate people more. I hope people would really save water. The way I see some people waste water is so saddening and maddening. People should realize that potable water is a precious resource and can potentially run out. The water utilities should repair busted pipes ASAP so as not to add to the wastage of water. So glad to hear this good news. So thankful that these companies are providing us excellent services.